I've been feeling rather "birdy" lately and enjoying doing bird paintings. I've had fun doing the blue heron ones I did lately. I think herons and egrets are such beautiful and graceful birds, so I decided to see if I had any good reference photos of other birds I might paint, since I'm always snapping pictures of birds. 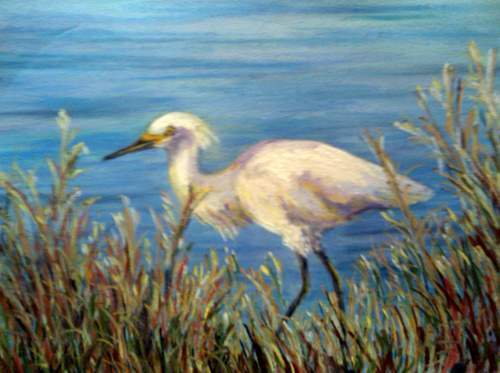 So this is one I did of a snowy egret I saw down in the Bird Island Park in Florida's Ponte Vedra Beach this past Christmastime. This was done on 9x12 sheet of art spectrum paper.